If Rockhampton's Central Queensland Thoroughbred Breeders Association ever requires an equine poster girl, Tinto Elemento would win in a common canter. 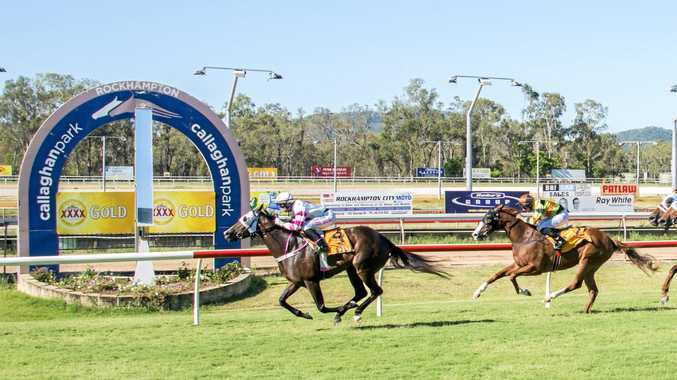 A graduate of Rockhampton's 2015 Capricornia Yearling Sale (CYS), would-be ambassadress Tinto Elemento completed a rare achievement at the Callaghan Park TAB race meeting last Tuesday, November 15. Tinto Elemento (br f 3 Red Element-Eminent Speed x Elusive Quality) won her third successive QTIS 3YO Handicap from as many starts this campaign. In the process, Tinto Elemento earned winning connections, which include her local trainer Peter Fleming, $20,550 courtesy of the lucrative fillies' bonus applicative to QTIS registered horses. This, the vastly improved filly had also done at her two previous wins at Callaghan Park on October 24 and first-up at Mackay on October 10. To be even more precise so as to endorse her "poster girl” title, Tinto Elemento, a good looker to boot, has now won five QTIS bonus races from just eight starts. As well, on two other occasions "Tinto” has shared in the prize money pool taking her earnings to well in excess of $100K. Not bad at all for a filly that was somewhat overlooked in the sale ring being passed-in for $9000 on a $10,000 reserve before being snapped-up by Peter Fleming and Co. In hindsight what a bargain and those that withdrew from bidding on the filly would no doubt be ruing their decision. However, there will be a second coming with her half-brother to be offered at next year's CYS in April. More on that soon but lets analyse Tinto Elemento's pedigree. Tinto Elemento's dad was the talented Stakes winning racehorse Red Element (b h 2004, Red Ransom (USA)-Tracy's Element x Last Tycoon). In many ways Red Element's blood is "worth bottling” as his sire Red Ransom is of international acclaim and sire of dual GR 1 winners including, the six times GR 1 winner Typhoon Tracy. Better still, Red Ransom has become a successful sire of sires as his stud sons include Red Dazzler; Duport; Onemorenomore and Charge Forward. Fact be known, Red Element is a half-brother to the Typhoon Tracy herself the 2009 Australian Horse of The Year. Little wonder Tinto Elemento can run; run and run as her paternal grand mother Tracy's Element was the champion South African filly and later mare during the 1992-93 and 1994-95 racing seasons. Tinto Elemento was bred by astute Alton Downs breeding buff Kerrod Smyth who along with wife Glenda runs the successful boutique operation Laurel Glen Equine Centre at Alton Downs. It is not the first time the Smyth's have offered and sold a top class young horse at the CYS, as they have done so on numerous occasions but none more to mind than grand prize money earner Mythologist. However, he gets a second chance to square the ledger so to speak as next year Laurel Glen will offer a cracking half-brother to Tinto Elemento sired by Altius. Standing at Bruce Watts' Riverside Thoroughbreds at Alton Downs for a pittance at just $2750, Altius (b h 2007, Redoute's Choice-Circles of Gold x Marscay) has a pedigree to drool over. He is a half-brother to the champions Elvstrom; Haradasun and closely related to the dual international globe trotting GROUP winning racehorse Highland Reel. "Altius is truly a blue blood thoroughbred and our colt for the CRA sale is one of just a handful of his offspring as sadly he has been neglected in Central Queensland. Truly if given the opportunity I firmly believe Altius will become a sensation at stud,” Kerrod Smyth said. Kerrod has my emphatic endorsement and that is because both Altius' parents Redoute's Choice and Circles of Song were not only racetrack champions but they were also breeding sensations.